The Swann Memorial Fountain, created in 1924, graces the center of Logan Circle. It was designed by architect Wilson Eyre, to memorialize Dr. Wilson Cary Swann, founder of the Philadelphia Fountain Society. Adapting the tradition of “river god” sculpture, sculptor Alexander Stirling Calder created three large Native American figures for the fountain, to symbolize the area's major rivers, the Delaware, the Schuylkill, and the Wissihickon. 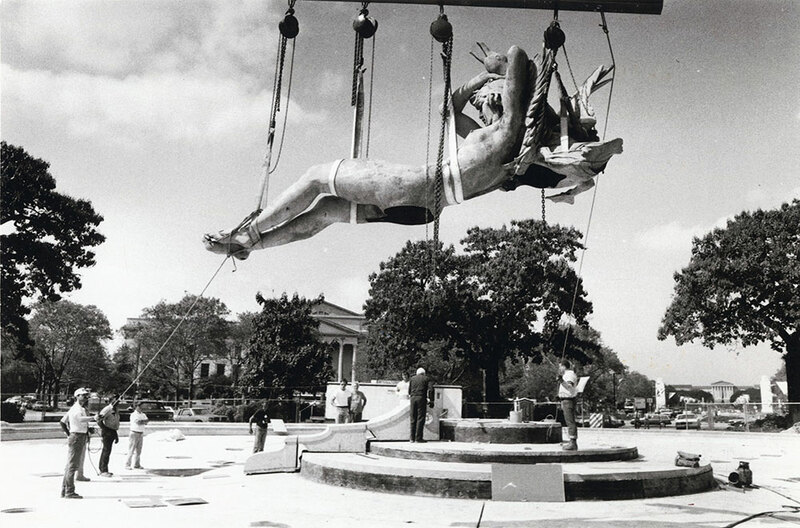 Seen in this 1989 photograph is the bronze sculpture of a mature woman --apparently being moved during rehabilitation of the fountain-- holding the neck of a swan, representing the Schuylkill River.